The Guadeloupe archipelago is a French overseas department in the Caribbean Sea. It comprises the islands of Basse-Terre to the west and Grand-Terre to the east, separated by a narrow stretch of water. Guadeloupe has everything you need for an unforgettable holiday; sandy beaches, a wonderful national park and impressive historic landmarks. Grand Anse, situated just 2km north of Deshaies on Basse-Terre, is a long golden beach with no resort developments in sight and is well worth a visit. Although it can get crowded, you can find quieter areas further down the bay. Basse-Terre is also home to a 43,000-acre national park. A hike through the rainforest provides a great opportunity to spot some indigenous wildlife such as the Guadeloupe raccoon, mongoose, agouti and over thirty species of bird. Guadeloupe boasts some exquisite French cuisine. Be sure to stop off at 'La Savane' in Deshaies, a seafront restaurant serving a selection of classics including veal kidneys and lamb fillet. You can get a feel for the islands’ culture with a scenic tour of Grand-Terre. In Pointe-a-Pitre on the west coast, you’ll find the Cathedrale de St-Pierre et St-Paul, a peculiar structure nicknamed ‘The Iron Cathedral’, due to the iron girders used to brace it against hurricanes and earthquakes. Another must see is the Damoiseau Distillery in Les Moule, which provides a fascinating insight into local rum production. 10km south of the main islands lies Terre-de-Haut. The main attraction on this small island is the 19th Century Fort Napoleon, which offers stunning clifftop views. After exploring the fort, stroll through the cactus gardens and visit the naval museum, where you can learn about the famous 'Battle of Les Saintes' in great detail, a four-day conflict between French and British ships in the 18th Century. 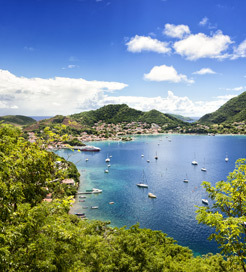 The only ferry route in Guadeloupe connects Trois Rivieres in southern Basse-Terre and Les Saintes in Terre-de-Haut, which is operated by CTM Deher. With two crossings provided every day, lasting around fifteen minutes, hopping between these Caribbean gems couldn’t be easier.